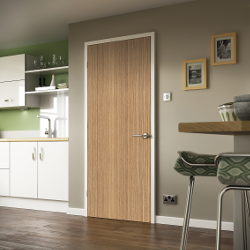 With a range of over 80 standard colours, patterns and woodgrain effects, the High Pressure Laminate (HPL) range from Premdor is the first choice internal door for high traffic areas where there is a potential for damage to occur, be it in commercial or domestic applications. The new white HPL door has a robust solid core construction as standard on 35mm doors and provides a white surface finish that could never be achieved by conventional painting. The white HPL door range is available ex stock for immediate delivery. Manufactured on a made to order basis, the extensive coloured and patterned range is more than capable of withstanding face impact, scratches and abrasions as well as a resistance to regular cleaning products. Available as singles, pairs and apertured doors using traditional solid core construction, the range also includes framed 30 and 60 minute fire doors. With one of the most comprehensive High Pressure Laminate ranges in the industry supported by a Nationwide delivery service, Premdor’s range offers versatility, durability and stunning good looks. For full details call 0844 2090008 or visit the Premdor door website.